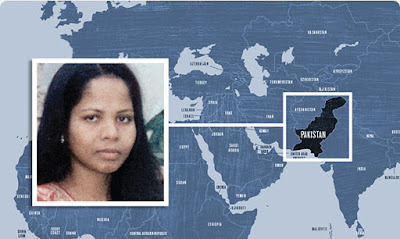 Lord, today we pray for Asia Bibi in Pakistan, imprisoned for over seven years and wondering whether life or death lay before her in the near future. We pray about her appeal to the Supreme Court of Pakistan, that her conviction and death sentence would be overturned. We pray for her safety and testimony in prison. Please protect her from other prisoners and, in fact, use her to reach those around her with the Good News about Jesus Christ. Lord, we also pray for her husband and children, who have been separated from her for so long. Strengthen their faith, hope and love for each other and you. Sustain them during this long trial. Finally, we pray for true freedom of religion in Pakistan. In Jesus’ name we pray, amen.